Having not had some of the other vintages that 2008 is compared to (2004 & 1999) I can only say that 2008 is much more approachable now than either 2006 or 2007 that I have recently tasted. I am a big fan of the 2007 and it is commanding a large section of my cellar (don’t tell Megan), but I don’t plan on starting to drink those bottles for a few more years, at least. At a recent trade tasting I had the opportunity to taste some some very nice 2008s and they were very drinkable. 2008 Domaine de la Mordoree Chateauneuf du Pape, La Reine des Bois (80% Grenache, 5% Mourvedre, 5% Syrah, 5% Vaccarese, 5% Counoise)(50% oak aging)($135) – beautiful interlacing of dark and red fruit flavors leading to more red fruit of currant and raspberry on the palate. Loads of secondary flavors on the palate including leather, mushroom, espresso bean with some more of those dark fruit flavors coming back towards the finish (blackberry). Structure was full bodied and intense, well integrated for such a young age. 2008 Domaine Grand Veneur Chateauneuf du Pape Rouge ($50) – baking spice and black cherry dominate on the nose in addition to nice notes of anise. 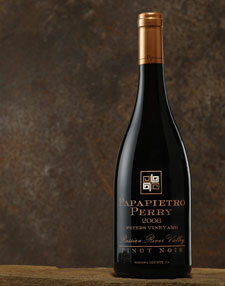 Palate is full bodied and surprisingly mature with similar flavors as the nose alluded to, with hints of mocha and suede. Long finish! I can’t say which is the “correct” vintage, but I can definitely say if you are looking to enjoy some CdP in the near future and can’t find anything on the shelf prior to ’06, look for an ’08. This was GREAT! I got to sample this at work the other day and I wish I could have had a whole glass of it. 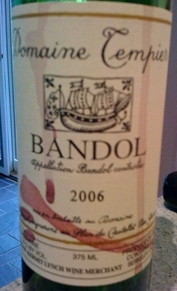 The Bandol was a bit tight on the nose, as it was popped and poured, but the palate was super expressive and lively. The mouthfeel was extremely polished with enough tannic grip to pull the reigns and give some structure to the everlasting finish. MMM! Working in a wine shop has its perks! One of them being I get to meet wine makers on a more regular basis than I normally would, for instance next Tuesday I get to have lunch with Ian Hongell, wine maker for Peter Lehman. 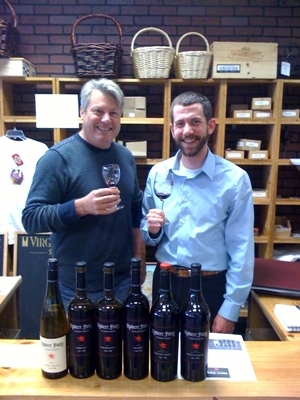 A couple of weeks ago I had the opportunity to taste with Bob Foley and taste the wines from his “Robert Foley Vineyards” brand. This is a big boy of a wine that is young and in for the long haul. Tons of palate rockin’ structure is complimented by the abundance of deep rich dark fruit flavors and the nice bacon fat component I often find in a lot of California Petite Sirahs as well as Sryah. Not inexpensive to say the least, but if you want a good age worthy Petite Sirah, give this one a go. At $65 this is a bit out of my price range for everyday drinking but I had the opportunity to sample the 2006 Domaine La Barroche Chateauneuf-Du-Pape at a trade tasting the other day. I have a few Chateauneuf-Du-Papes resting in my cellar, and tasting this wine made me want to open every last one of them. The blend is predominately Grenache (64%) with Mourvedre (17%), Syrah (11%) and Cinsault (8%) making up the rest of the blend. With the help of 4 weeks of skin contact, the Barroche has an amazing richness and intensity. The cooperage for this was done separately for each of the components: the Mourvedre was aged in 2 and 3 year old Burgundy barrels sur lees, 60% of the Grenache in old oak casks, 40% of the Grenache in Stainless Steel tanks, and both the Syrah and Cinsault were aged in old oak caks. All aging was for approximately 18 months before being bottled, unfiltered, in spring of 2008. If you couldn’t tell already I was enamored with this wine, and if it wasn’t for the price I would drink it once a week. The 2006 is still a baby though, the tannic structure could use some smoothing out, but for being so young it is drinking quite well now. This is a big boy California Cab. 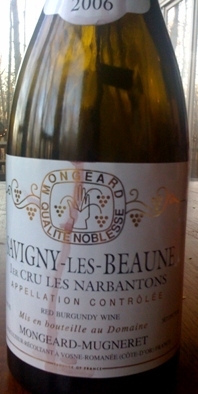 The fruit is right up front on the aromatics as well as on the palate, but is very rich and not “juicy juice”. The chocolate overtones compliment the black fruit flavors and the splash of toasty oak very nicely and the years have been kind to the tannins that are rounded out nicely. Not cheap in the slightest but would be a nice treat for a Saturday night! The 2006 d’ Arenberg Dead Arm Shiraz ($60)is still a baby, another 2-3 years and this guy will really open up and smooth out. That being said, it is still drinking well now, just be ready for some mouth grabbing tannins. A good wine, but a bit of a let down. The 2004 Longview Block 11 Cabernet Sauvignon is one of the high end wines from Longview winery. 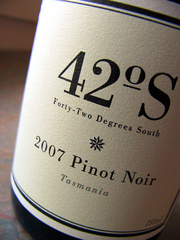 For the most part, Longview wines stay under the $20 mark and offer some good value from Australia. The Block 11 Cabernet from 2004 however was $45 and when I tasted it a year and half ago, was happy to buy 2 bottles from the tiny allocation that came to the local wine shop. After drinking one of the two bottles the other night, I was rethinking spending that much money on the aforementioned wine. Now don’t get me wrong this was still a kicking Cab, but I am sorry to say it may be on the back side of it’s peak. Or I could be totally wrong, or it could be in a slightly “dumb” stage as “they” say, but it definitely wasn’t the power house it was almost 2 years ago. Now what it was was a super polished, elegant Cab with upfront rich fruit flavors layered with leather and brown spice but the tannins just sort of gave up in the end. I would hate to think that this bottle was past it’s prime being that it was only bottled in 2006 and for the fact that I have another bottle that I wanted to see develop for another 2 years’ish. I guess part of my disappointment with the wine is that I had had such high hopes after tasting it and laying down 2 bottles, but as I said and as you can see from notes, this was still a good Cabernet. Not that you could find a bottle on shelves anywhere but I am curious if any of you in the wine blogosphere have had a bottle of this recently and have tasted it in the past. If so, shoot me your thoughts, I would love to hear them. Additionally, do you think I should open the other bottle soon, or hang on and hope it continues to improve? I am leaning towards the open it soon, only for the fact that if the tannins are already fading away, they aren’t going to regenerate in the bottle.